Goddess Durga, the invincible, is an important figure in Hindu mythology. She embodies feminine energy or Shakti and believed to hold all the powers of the Universe and created by the combined energy of the Creator (Brahma), the Preserver (Vishnu) and the Destroyer (Shiva). Maa Durga is invoked by many names. These are reflective of her powers and the many qualities she possesses. Goddess Durga is commonly known as Mahisasuramardini or the one who killed the demon Mahisasura. Maa Durga has many incarnations and names like Parvati, consort of Shiva, Himavati, daughter of the mountain, Brahmacharini, one who observes true penance and Chandraghanta are names given to the avatars of Mother Durga. 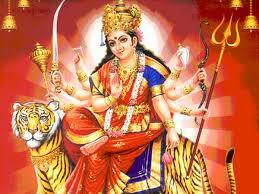 Goddess Durga is also known by names that described her appearance. For instance she is also called Dashbhuja, or one with ten arms and Trinayani Durga, the one with three-eyes because of her popular image in which the Goddess has ten arms and three eyes respectively. Goddess Durga is known to be both ferocious and compassionate. Her fury and anger is revealed in the form of Kali, the dark one and is associated with a more compassionate nature in Gauri, the fair one. 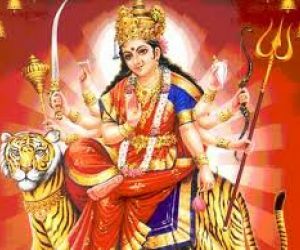 In her most common image, Goddess Durga is seen holding different weapons, which, as legend goes, were given to her by the different Hindu Gods. since she is said has the combined powers of Brahma, Vishnu and Shiva, she is also known as Brahmani, the creative force, Vaishnavi or the preserving force and Rudrani, the destructive force. There are 108 names by which Goddess Durga can be addressed by her devotees. Some of these are Devi, Varada or granter of boons, Tribhuvaneshvari or the Goddess of three worlds, Mahachakradharini or the one who holds the Chakra, Vividayidhadhara or the one who holds various weapons and so on. During Durga Puja, Goddess Durga’s devotees worship the nine forms of Durga. He devotees invoke her blessing as well as pray for her protection against all evil. Goddess Durga represents the victory of good over evil and is said to grant her devotes the positive energy and spiritual qualities necessary to lead a life of happiness. Each of the days of Durga Puja holds a special significance. Along with Goddess Durga, Goddess Lakshmi and Saraswati are also worshipped and said to bring complete harmony of the mind body and soul. This Puja is celebrated in the month of Aswin and Hindus all over the world hold special celebration and festivities to honor Goddess Durga.